Geek of All Trades » Magic: The Haunting? It’s almost time for the new block of Magic expansions to start. This new block starts with the set called Innistrad and releases on September 20. That means that next weekend will be the prerelease events at card stores all across the country. The concept of this set, if not the whole block, will be horror related concepts. There will be vampires, zombies, spirits, and even werewolves. Yes, werewolves which have only made a couple appearances so far (Lesser Werewolf and Greater Werewolf) are making a significant appearance in this set. As with any monsters, there are also hunters. Angels and hunters are based in the white while the horror based creatures are based out of black, blue, green, and red. As with any expansion, certain keywords, abilities, or special ways of playing are featured. 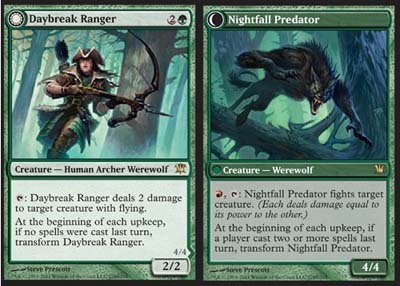 With Innistrad, flashback returns. On top of that comes something that has never been seen. One of the cards is shown above. That’s not 2 cards or one card with 2 options on one face. It’s one card with 2 sides. The traditional brown Magic the Gathering back showing the 5 colors will not appear on these cards. As can be seen, the casting cost only appears on one face, the one that the card starts on. Because these cards don’t have a traditional backing, they will need to be played with opaque sleeves or by using a checklist proxy card that will be included in the packs for each flip card you wish to play. While the concept of the flip cards is interesting, it will definitely complicate play a little bit. As with a lot of the other odd effects that have come before (the cards with 2 smaller cards on the main face, split color mana symbols, and the Phyrexian mana symbols), we probably won’t be seeing this again past this block. 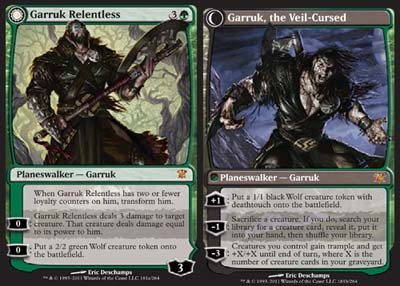 That being said, there is one flip card I’m really looking forward to, a flip card Planeswalker, Garruk Relentless (which changes into Garruk, the Veil-Cursed), which is pictured below. As the first expansion of the new block, this will be a large block and he following 2, containing 264 cards. With the release of this set and the start of the new block, the Zendikar block and M11 set will both be dropped from being usable in standard tournaments. I’ve only recently started playing standard as I used to just play casually with friends. This switch will be an interesting change for me. This set will definitely be an interesting set to check out.